The first marketing director of Facebook (FB) and the sister of co-founder Mark Zuckerberg has some advice for all Internet users: Take a break. "It's a great idea at least once a week to put the devices down, take a bit of stock in yourself and your behavior," says Randi Zuckerberg, the CEO of Zuckerberg Media. 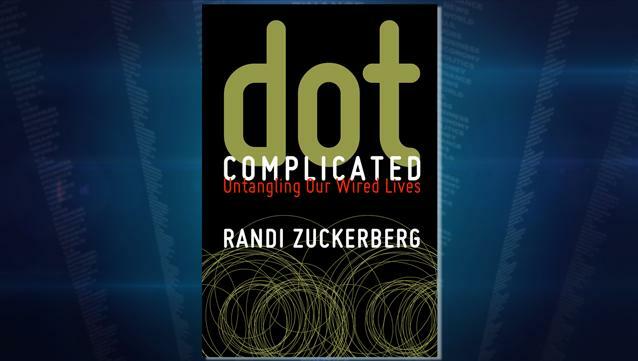 This "digital sabbath" is just one of the many recommendations Zuckerberg offers in her new book Dot Complicated: Untangling Our Wired Lives. Zuckerberg says a temporary disconnect from the Internet does not contradict the purpose or message of Facebook. "This is really in line with Facebook's message of sharing with the people you want to share with and doing it mindfully and consciously," says Zuckerberg. "Unplugging and connecting to people in the real world ...just strengthens the relationships you have with them online as well." It also reflects a shift underway with Internet users. "In the beginning it was about getting the most eyeballs possible, connecting to as many friends as possible, getting the most followers on Twitter (TWTR)," Zuckerberg notes. "We've become closer to friends but further from friendship." Now she says the pendulum is swinging back to a time when "people are valuing their intimacy again, their personal relationships." Watch the video above to see what else Zuckerberg has to say about online etiquette. Katy Perry is #1 on Twitter, So Why is the Board All Male?